Average Weight	: 45 - 60 lbs. The Ibizan Hound has been depicted in many Ancient Egyptian art forms, and dogs painted on hieroglyphs and sculptures from over 5,000 years ago closely resemble the hound. The Ibizan Hound is very similar to the Pharaoh Hound, with the main difference being coat color and the Ibizan's larger size. Depictions of dogs that looked much like today's Ibizan Hound were found in ancient Egypt around 3400 BC. The dog is thought to have been brought to the Western world from Egyptian and Spanish traders around 700-900 BC. It is a common dog found on the island of Ibiza and nearby islands often reduced their rabbit and small game counts because of Ibiza Hound hunts. The dogs were used to hunt rabbit, providing food for the islanders. The dogs also hunted for themselves as they were not fed by the humans. This fast, hunting Greyhound type is able to hunt in both daylight and night. They hunt by sight, hearing and smell, alone or in packs. When the prey is discovered, the Ibizan points and when it bolts, the dog's sighthound instincts come into play and the hound is full-flight in strong pursuit. When the prey is captured the dog can be trained to bring it back to the hunter like a retriever. The Ibizan Hound is often used in the sport of lure coursing. Since the Ibiza Hound enjoys many types of hunts and terrain-exploration, it has become a very fast breed. Working primarily by sight and smell, it can also be used for nocturnal hunting and is a valuable asset to many game hunters. Many Spanish hunters have become famous for running and raising these dogs in packs so that they can make the most of their instinctual skills. This breed is excellent in the sport of lure coursing, and can also make an exceptional show dog. The Ibizan Hound has a large and multi-colored coat, and is most often associated with the Pharaoh Hound. The Ibizan Hound is often called a Beezer for being clean, playful, polite, and quiet. They do get excited but are sensible and sensitive to their surroundings. They are independent dogs, and can be protective of their owners. They are watchful and vigilant, making them instinctively secure and helpful with staying guarded. 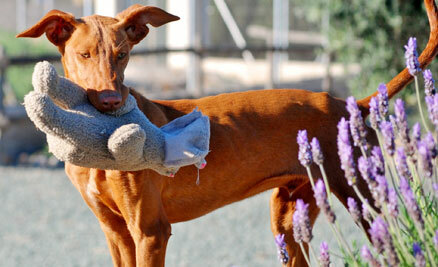 The Ibizan Hound is bred to hunt small creatures such as rabbits, cats, rodents, mice, and other small pets. Its best to keep these animals out of their way, but cats will fine as long as the hound knows it well enough. The Ibizan Hound socializes well with other dogs, humans, and even children. They are especially well-suited for companionship with puppies of their own breed, and are pack animals by nature. Introducing a baby to the family must be done carefully since the Ibizan Hound can become very guarded with any new people in their territory. These dogs tend to mature quickly and rapidly, as they are natural learners and will pick up skills with great vigor and intensity. They enjoy plenty of exercise, and tend to get bored easily. If they are not trained properly, they may become destructive, loud, or gruff. It is important for trainers and family members to watch their tone and language as these dogs are very sensitive to voice and noise. Grooming requirements vary depending on the variety of Ibizan Hound. There are three different varieties of Ibizan Hounds: smooth-haired, wire-haired, and long-haired. Since the hair is generally short, it does not require much maintenance and grooming. The best way to keep the smooth-haired coat in good condition is to run a rubber glove over it. Wire-haired varieties can be simply cleaned up with hand-plucking, and occasional brushing will help keep hair smooth, soft, and silky. Brushing also helps to stimulate the skin's natural oil production, and long-haired types will require additional brushing sessions to maintain their fresh sheen. Owners of the Ibizan Hound will need to make sure that ear passages are clean and claws are kept trim and clean. This breed tends to shed at an average rate, and thus makes it less necessary to worry about stray hairs and shedding on furniture. Nails can be clawed completely or at least kept short. This ensures that the dog is comfortable and can engage in physical activity on a regular basis. Maintaining the length of the claws may require you to clip them yourself or have this completed by a professional. Bathing and shampooing are necessary on a regular basis, but even more so after extra play or rolling in dirt. The natural smell of the dog is a good indicator of when a bathing session is required. Checking for ticks during tick season is a good idea, and taking the dog to the Vet on a regular basis will ensure that they meet other health criteria. Since the Ibizan Hound has boundless energy, they naturally require plenty of exercise. If they are not found in a large fenced-in area, they are more likely to run away so it is best to keep track of this dog even when they are in the backyard. The Ibizan Hound requires between two to three long walks per day, and will often stretch their legs after a run. They enjoy running alongside bicycles, or with rollerskates. They should not be running until they are fully grown, however, as too much exercise can harm the young puppies. Since these dogs are incredibly independent and lively, they are also very fast. They will tend to dart off on their own if they are unrestrained; it's important to maintain them in a secure area when they are unleashed. An ideal exercise for them is to run alongside with you for a long stretch, or taking an early morning and early evening walk. They need fresh air and plenty of space to run freely. It's important to remember that the Ibizan Hound can also jump higher than most dogs from a complete standstill, and can jump over fences if they are unrestrained. It may take some time to train them to come back home if they are unleashed in a park or other large setting. Each dog has its own personality, so it may take some time to learn what type of exercise suits your dog best. Different activities and different environments will keep the dog's mind sharp, attentive, and alert. The Ibizan Hound is happy and well-behaved when you pay enough attention to its needs, and you can steadily increase its physical stamina over time. The Ibizan Hound needs plenty of exercise and space to move around, so apartments are all right for these dogs as long as they receive enough exercise and can engage in their favorite physical activities. They are moderately active even indoors, but will be at their best with a back yard or lawn space. These dogs can jump very high and can jump over fences with ease. They move fast and efficiently and are not easy to catch once they are motion. They are sighthounds so they naturally will hunt by sight rather than scent. They have selective hearing as well, and will train themselves to hunt in specific settings. The Ibizan Hound has a tendency to run off on its own and not return until they feel like it. This can make it difficult for owners to trace them down, and since their chase instinct is so strong, they may be more prone to traffic accidents and disasters. They are best kept in a fenced area where they have room to exercise on a regular basis. The most suitable space for them is at least 40X60 feet. Since their coat is thin and not very protective, they are also sensitive to cold and will fare well in warmer climates and surroundings. The Ibizan Hound is very intelligent and will learn new skills exceptionally quickly. They are very sensitive to noise and voice, and will pick up your tone immediately. Ibizan Hounds can gain a lot of skills with a respect training program where you are involved with teaching good manners and correcting behavior problems with ease. This breed learns well with education and teaching it positive daily behaviors will help you earn its respect. Training in small steps is ideal since they can become overwhelmed easily with an overbearing training method. These dogs need constant stimulation and will learn well in an interactive setting. It is important to use the right tone at all times, and make sure that enough attention is given to the dog's weaknesses as soon as they become evident. Harsh criticism, manners, and tones can cause this dog to lose respect and become hostile. It's important to understand the personality of the dog before implementing steps for change. Early training and socialization will help the Ibizan Hound bond with both humans and small animals. They are gentle with young children, but their size and activity level can be overwhelming for some children. Making sure the dog receives plenty of physical touch and affection is an important part of their growth. The dogs will bond better with other dogs and family members when they feel comfortable, respected, safe, and secure. Canine hip dysplasia (CHD) can cause mild to severe lameness. Osteochondritis Dissecans: a degenerative disease of the joints, associated with over-nutrition and too-fast growth of puppies. Collie Eye Anomaly: can cause blindness, but is not a progressive disease. Seizures: Some lines of Ibizan hounds are more prone to seizures. Von Willebrands Disease: a blood clotting disorder. Hypothyroidism and Hyperparathyroidism: conditions of hormonal imbalance.